Most molecules, including proteins, are too large to pass directly through membranes. Instead, large molecules are loaded into small membrane-wrapped containers called vesicles. Vesicles are constantly forming - especially at the plasma membrane, the ER, and the Golgi. 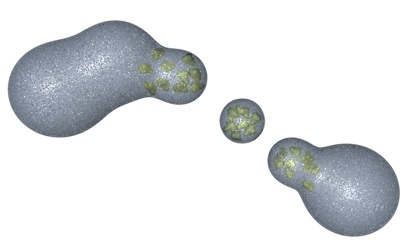 Once formed, vesicles deliver their contents to destinations within or outside of the cell. A vesicle forms when the membrane bulges out and pinches off. It travels to its destination then merges with another membrane to release its cargo. In this way proteins and other large molecules are transported without ever having to cross a membrane. Some vesicles form with the help of coat proteins. Geometrically arranged coat proteins on the surface of the membrane help the vesicle to bud off. Fluorescent dots (transport containers) explode in a burst of light as they fuse with the plasma membrane and expel their contents out of the cell. Video courtesy Kai Simons, Professor and Executive Director, Max-Planck Institute for Molecular Cell Biology and Genetics, Dresden, Germany. Reproduced from the Journal of Cell Biology (2000), 149: 33-40. ©2000 The Rockefeller University Press. Busy cells are often filled with thousands of traveling vesicles. To help organize these vesicles and get them pointed in the right direciton, the cell uses the rigid filaments and tubes of the cytoskeleton. Special motor proteins attach to cargo-filled vesicles and carry them along the cytoskeleton like trucks on a highway. Different motor proteins are specialized for carrying certain types of cargo and for traveling along the cytoskeleton in one direction or the other. Careful matching of motors with their cargo helps vesicles reach their targets. Motor proteins attach to vesicles and walk along a microtubule of the cytoskeleton. Dyneins walk toward the microtubule organizing center (MTOC, or centrosome) and kinesins walk away from the MTOC. Real-time video of vesicles traveling along neurons inside a living fruitfly embryo. The three columns of moving vesicles show the locations of three different nerves. Each nerve is a bundle of axons from many neurons (a specialized cell type of the nervous system). The vesicles are visible because they contain Green Fluorescent Protein. Video courtesy Bill Saxton, Ph.D., Professor of Molecular Cell & Developmental Biology, University of California Santa Cruz. Some vesicles have unusual ways of getting around the cell. The ones shown here can be seen rocketing through the cytoplasm. To do this they build up actin proteins (in red) at their rear. The polymerization of actin into short filamets acts as a molecular jet pack. Video courtesy Jack Taunton, Ph.D., Associate Professor, Cellular and Molecular Pharmacology, University of California San Francisco.Reproduced from the Journal of Cell Biology (2000), 149: 519-530. 2000 The Rockefeller University Press. Genetic Science Learning Center. "Directing Traffic: How Vesicles Transport Cargo." Learn.Genetics. September 2, 2010. Accessed April 18, 2019. https://learn.genetics.utah.edu/content/cells/vesicles/.